WDIO could have reported the entire story. I assume Mayor Skraba was referring to either the resolution unanimously passed by the Ely City Council or the resolution passed by the St. Louis County Commissioners. The seven commissioners passed it by one vote, 4-3, hardly an affirmation, and an amended version that basically supported the environmental review and permitting process. WDIO could also have reported that, in February, Democratic caucuses in townships surrounding Ely passed sulfide-mining resolutions, either to not permit sulfide mines “if they threaten” our waters, or asking for “prove it first” legislation. Morse Township, Fall Lake Township, Winton, Unorganized 64-12, Eagles Nest Township, Breitung Township, Stony River Township all passed resolutions. Even the Ely precinct was divided; with the sulfide mining resolution defeated 30 to 26. Four votes. These results were not an endorsement by a community, despite the implication having been made that the support was an essentially unanimous one. Hardly. The people at these caucuses were all members of their community. They live there, they work there, they support or own local businesses, they volunteer and support the schools, they vote, and they pay their taxes. To leave their opinions out of the discussion – more than half of the vote – is only telling half of the story. 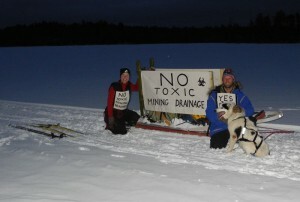 Coincidently, also on Feb. 29, sled dog teams kicked off from Ely and Grand Marais, relaying to deliver sulfide-mining petitions with thousands of signatures to Gov. Mark Dayton at the Minnesota State Capitol. They are due to arrive at the Capitol on the morning of March 8, carrying petitions asking the governor and the Legislature for protection of Minnesota’s waters – all representing community voices expecting to be heard. WDIO quoted several other local officials. “’We’ve been mining on the Range for 130 years. We know how to do it,’ said Sen. Dave Tomassoni.” That is why the mining industry in Minnesota has been fined over $700,000 since 2004, and now has water and air contamination it cannot clean up. “Rep. Carly Melin said, ‘We all use these metals and there’s no reason to get these from a foreign country.’ ” Glencore would be selling them on the open market and we would still be buying them back – if we were not outbid in the process. “St. Louis County Board Chair Keith Nelson said, ‘If it can’t be done safely here, it can’t be done safely anywhere.’ ” That is the point; sulfide mining has not been done safely anywhere, including in the United States. To play those kinds of odds is illogical. Maybe the entire state wants to hum a different tune, including the Arrowhead of Minnesota. Maybe it is time we all tried humming in unison. Together we can find ways to improve the economic picture without harming what Minnesotans unabashedly love: our most valuable natural resource – our waters. Sulfide-mining doublespeak: Sulfide mining will not pollute — just don’t put that in writing! I feel very sorry for the people of Ely and those north of the divide due to the ignorance of city and state officials that would even consider threatening their most treasured resource, the BWCA. My grandparents and parents lived in Ely. My grandfather taught highs cool there and managed basswood lodge. My parents have lived summers on Fall Lake for 20 years. We were on the conservationists with common sense side years ago but now believe that sulfide mining is sure death to our waters. Why would the prove it first law be at least the first step? I truly hope those that believe this is the most idiotic thing to do north of the divide are willing to fight for what they believe. I am! And I have plenty of friends that know how to do what’s right for this environment as well. C.A. Arneson have you considered sending samples of the water off for testing? perhaps proving that the water those very politicians are drinking would have some effect on their conscience?